GEO ExPro - Does Geology Last Forever? The North East Yorkshire Geology Trust is an independent, not- for-profit organization involved in geoconservation: protecting our wonderful geodiversity, including the natural range of geological and geomorphological features and processes that compose and shape the physical landscape and sharing it with as wide an audience as possible. 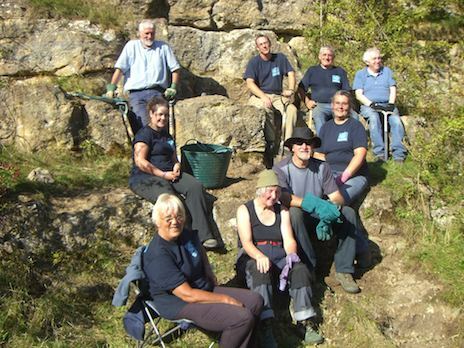 We are similar to a local wildlife trust for rocks, fossils and landscapes. We care about our Earth heritage. Despite the expression ‘solid as a rock’, geology is in danger, as important sites disappear or are damaged, through threats such as unsustainable fossil collecting, coastal erosion, quarrying, infill of disused quarries and vegetation overgrowth. We want to ignite the passion of future generations for the science of geology and communicate to all the information locked in our rocks and landscapes because we are specialists in geoconservation and believe that geology should be enjoyed. On the ‘protect’ side, we undertake active geoconservation: clearing geological faces, viewpoints and sites; surveying; doing research; drawing graphic logs and management plans; recording the information uncovered in our GIS; keeping abreast of changes in the landscape and being consultees to the four local planning authorities in our area. Geonauts on a Fossil Walk. Source: North East Yorkshire Geology Trust Our experience as practitioners of geoconservation, particularly over the last eight years in North East Yorkshire, has led us to produce a ‘Handbook of Geoconservation’, to raise issues that are seldom discussed and to propose a way to improve the state of geoconservation both in our region and nationally. This outlines our take on the issues that hold back geoconservation, such as the absence of a protocol, as already exists for biodiversity and archaeology, as well as site designation, the planning process, access and insurance, the lack of dedicated resources and in general, the perception that geology lasts forever. The need to tackle geoconservation issues in a different way has arisen because geology is taken for granted, ignored even. How is it that a quarry, which owes its very existence to geology, does not automatically have geology at the core of its restoration plans? Active quarries present geologists and earth scientists with a unique opportunity to see fresh rock exposures and discover new evidence of our earliest history and yet even when faces are preserved, they are not always ramped and safely accessible. Access and insurance are discussed in our Handbook, as the burden of liability and related costs on landowners are another strong barrier to geoconservation. Another crucial issue raised by our ‘Handbook of Geoconservation’ is designation. There are many UK designations, with a confusing collection of acronyms, such as FIGS (Forestry Important Geological Sites); LGS (Local Geological Sites); MCZ (Marine Conservation Zones); RIGS (Regionally Important Geological and Geomorphological Sites); or SSSI (Site of Special Scientific Interest). In terms of conservation, these designations generally create an exclusion zone around a site, and yet offer no real protection, no guarantee of a site’s good condition or future existence. In our Handbook, we question the whole process. Has designation run its course? Is there a better way to use the meagre resources available than creating new site designations? Ultimately, is designation benefiting conservation? Should a blanket designation be considered where all sites are valued? Our experience is that there are big gaps in the process, particularly with regards to newly discovered sites, and there is also an absence of protocol beyond designation. For example, at Ardley in Oxfordshire, a site of international significance for dinosaur track-ways, designation wasn’t an option until years after the site had disappeared under landfill. Mike Windle (now Director of North East Yorkshire Geology Trust) and the Oxfordshire Geology Trust, which he had founded, tried their best to save the site. They were involved too late on the project and only managed to raise the awareness of this awesome site with the general public and to protect any tracks, which may be found in future in further site extensions. 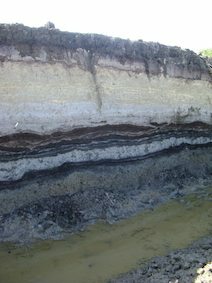 A Dansgaard-Oeschger Sequence in a quarry in North Yorkshire – evidence for rapid climate change. Source: North East Yorkshire Geology Trust We strongly believe in the need for a concerted effort to improve the state of geoconservation. Creating a one-stop shop for all geoconservation questions, which could offer unbiased expertise and liaise with all parties, would be a step in the right direction. To that end, the Geology Trust has designed a mechanism to improve the future of geoconservation: the Geoconservation Hub. Our independence and expertise at the coalface of geoconservation, in landscape interpretation and geology, place us well to be that hub – a centre for excellence in geoconservation. 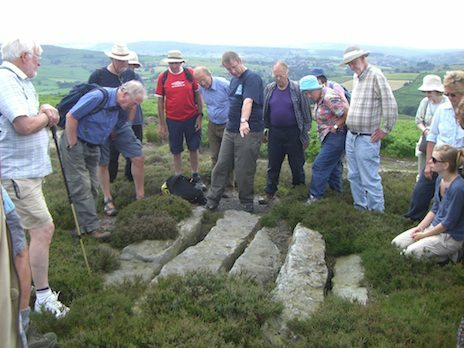 As the Geoconservation Hub, the North East Yorkshire Geology Trust is the first port of call for landowners, quarry operators, developers, planners and other interested individuals and geologists to ensure that geodiversity is taken into consideration, evaluated and protected. It proposes a practical approach that respects business practices, accommodates development and considers the value of geology in wider terms: as a science, a source of wealth, an educational resource, the foundation of our settlements and our modern world and a 'source of great enjoyment in our leisure time. The Hub raises the awareness of our rich geodiversity with the general public, helping educate future generations in a better understanding and appreciation of our environment, and help broker informed and inclusive agreements, winning deals which benefit all parties involved in some way and lead to an improved condition for geodiversity and a strong protocol for better geoconservation. These are just a few of the issues that led to the design of the Geoconservation Hub and the approach of the North East Yorkshire Geology Trust. Such a pragmatic, dedicated and inclusive approach is essential and crucial if geoconservation is to have a sustainable future. It is time to recognize geodiversity, to acknowledge its value, respect it, protect it and share it. Quarries often make excellent classrooms and our project ‘Making the most of 1Geodiversity in Aggregate Quarries’ (supported by the now defunct Aggregate Levy Sustainability Fund) has enabled us to demonstrate this, particularly at Wath Quarry in North Yorkshire. 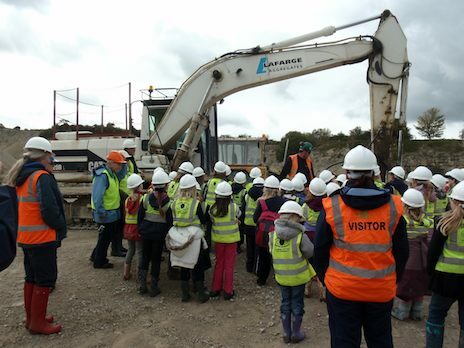 The Geology Trust organized with quarry operator Lafarge a brilliant field trip for primary school children from nearby villages. The heavy machinery was a definite source of attraction, as were the big crystallized ammonites and the rock samples the children took back to their school. The Geology Trust undertakes Geonaut Events with schools across the region as well as local groups of people of all ages. Geonaut Events are a creation of the Geology Trust. They reflect our inclusive attitude, involving people in the discovery of their local heritage and how their planet works, a holistic approach and introduction to science and the skills of a naturalist. These events are about discovering the secrets in our landscape, interpreting the clues gathered during a field trip and building a story, which is evidence-based and captivating. 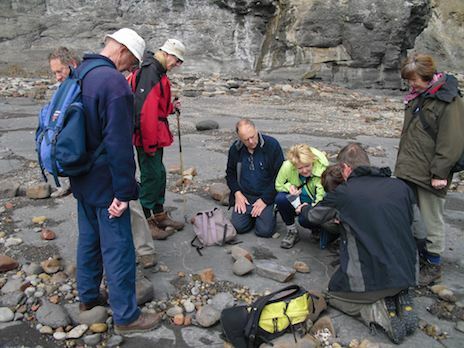 If you want to know more about the Geology Trust or the ‘Handbook of Geoconservation’, soon to be published, please contact Mike Windle, Director of North East Yorkshire Geology Trust, on +44(0)1947 881000 or email [email protected].